Capture the full acoustic spectrum to process and analyze rodent ultrasonic calls and other animal vocalizations. 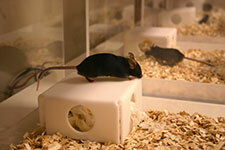 UltraVox XT analyzes sound, including ultrasonic vocalizations made by rodents. You can select calls visually in a spectrogram and categorize similar calls based on frequency, amplitude, duration, and time gaps. Easy export to EthoVision XT and The Observer XT allows you to combine the acoustical events with other behavioral data. Identifying ultrasonic vocalizations in rodents is useful in studies on social behavior (e.g. autism related) and anxiety or pain studies, such as those in drug development and safety studies. Besides studying the number and durations of the calls, researchers use spectrograms to identify other characteristics of calls.